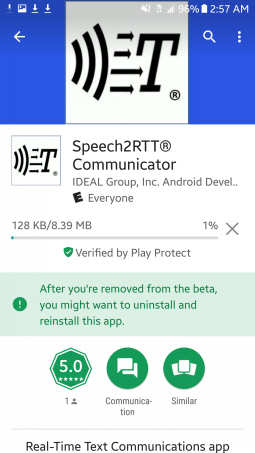 Use Google Play to search for “Speech2RTT.” You will land on the following entry. Click the Install Button. 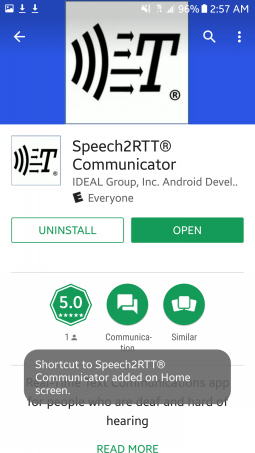 Speech2RTT® will now be installed on your Android smart phone. Keep scrolling down until you see our Disclaimer. Please read it as you scroll further down. 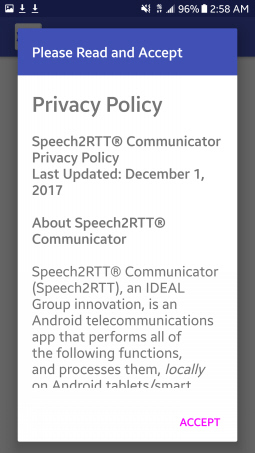 If you do not accept these policies do not install or use Speech2RTT®. 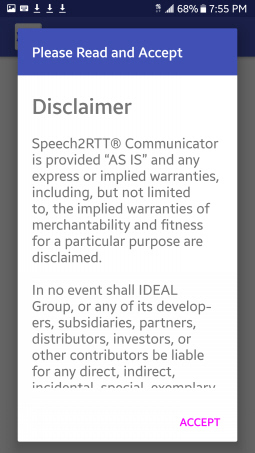 After clicking “Accept,” you will see the first of four permission you need to grant Speech2RTT® in order for it to work. 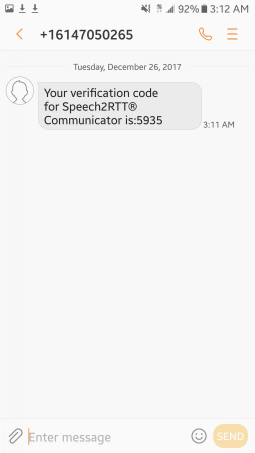 Click “Allow” to give permission to Speech2RTT® to access your microphone. 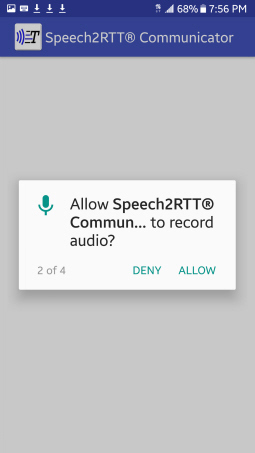 This permission is needed for the following reason: In the Android world, capturing sound audio for any purpose is called “Record Audio.” Unfortunately, there’s no way to change this wording, although we’d like to. 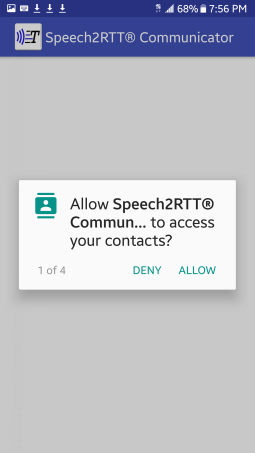 This permission is necessary in order to provide Speech2RTT® access to your microphone so that you can use our speech recognition and transcription services. We are not recording your audio. Click “Allow” to give permission to Speech2RTT® to view SMS messages. 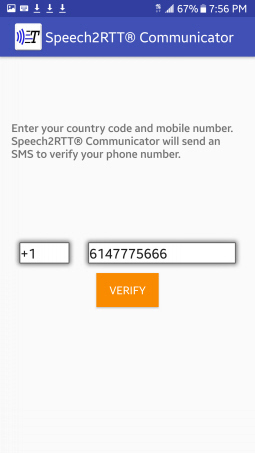 This permission is needed to enable users to validate and link their phone number to the services being offered by Speech2RTT®. 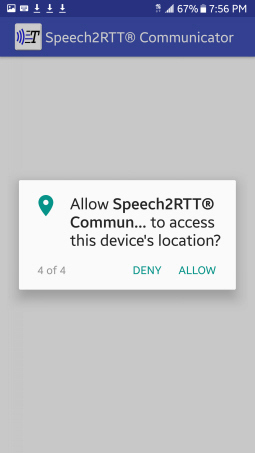 Click “Allow” to give permission to Speech2RTT® to access your device’s location. Why this permission is needed: Enables our system to automatically validate the country code preceding your phone number. After entering your area code and phone number, click the “Verify” button. 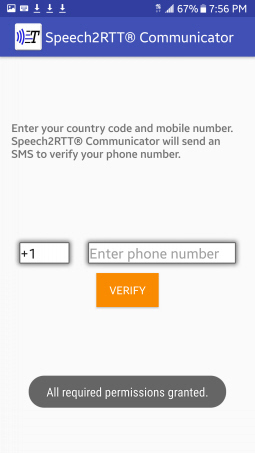 Speech2RTT® will then send a text message to itself, using your phone number. 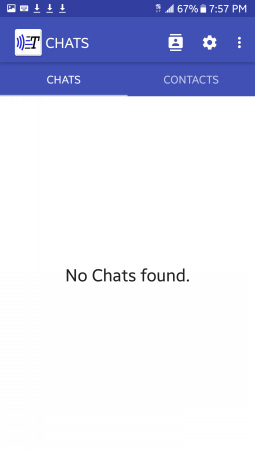 You will see the message “Waiting for SMS…” while this is happening. 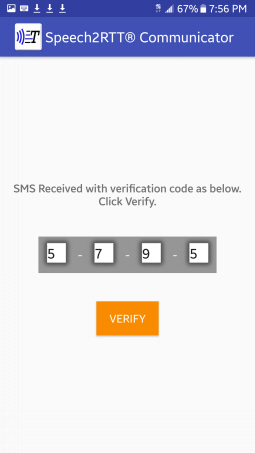 Once received, the verification code will be automatically inserted into the blank fields. 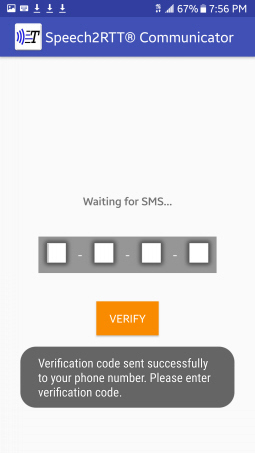 Should this not happen automatically, manually retrieve the code from the SMS message sent to your phone and manually enter it. Then, click “Verify. 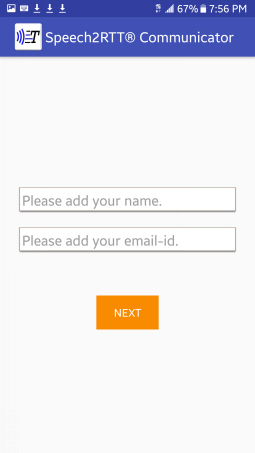 You will then be prompted to enter your full name, First + Last, as well as your email address. 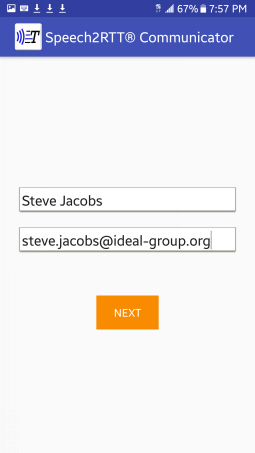 Once you enter your name and email address, click “Next.” Congratulations! 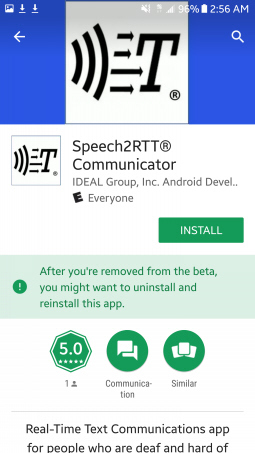 You have successfully installed Speech2RTT®!